Weddings are full of with micro-stories: Intimate moments that would go unnoticed with just a portrait approach. On your wedding day, my goal is to keep your memories. For this purpose, I use a mix of portraiture and photojournalism that provide a thorough perspective of every wedding. I don't have planned poses, or an established amount of pictures I'm willing to make. I'm always ready and looking to preserve the memories of your wedding as it is: unique. While I always take a time for the beautiful, directed portraits, that is not the full extent of my work. I like arriving 2 hours before the wedding ceremony, so I can capture the getting ready process of both lovebirds. After all the details and accessories are done, I like to steer my attention into the excitement of the nerve-racking process that happens before the wedding starts. After each fianceé is finally dressed and ready, I do a short portrait session while hair and make-up are at their best. Depending on the logistics and priorities of each couple, there is an optional moment before the Ceremony: the First Look session. In this session, the couple will see each other for the first time in private, and I'll be there to take candid photos of such intimate moment. The good thing about opting for a first look session is that, after the initial shock is gone, I use the opportunity to capture the couple portraits to get you more free time for hanging out at your own cocktail hour. Depending on the logistics of your day, you could also choose to have all or the most important of your group formal photos done prior to the Ceremony. Learn more about your First Look Session. During the Ceremony time, I focus on one sole thing: emotion. In an unobtrusive manner, my goal is to keep an eye out for every tear, nervous laugh, and the beautiful looks you'll exchange with each other as you perform the rituals of the most emotional part of the day. This is the least directed part of the day, as I won't want to distract or take away from such an important and symbolic moment of your wedding. After the Ceremony, while your guests are enjoying the cocktail hour, this will be the moment when all group and couple portraits are done if you didn't opt for scheduling a first look into your day. Usually, 10 to 15 minutes is enough the group formals, and an additional 15 to 20 minutes for the newlywed photo session. After we're finished with all the directed portraits, I'll rush to the reception area, where I'll capture the decor photos before guests come in, to ensure the best condition of the ballroom and settings. The dinner and Reception coverage is, like most of the day, captured with a photojournalistic approach. I focus on all those little moments that happen throughout the day and make each wedding unique. In the last eight years, I have found that’s the best way to keep all the memories of your day-of. A week after the wedding, you will receive a link to an online gallery which contains all the proof images of your wedding date. This gallery can be shared with loved ones and everyone you share access to can order prints or download their pictures directly from that client site. I also offer digital and professionally printed products. Beautiful hand-bound wedding albums are always a couples' favorite, complemented with mini-replicas for parents. I love sessions! Engagement sessions help us break the ice and get to know each other before the big day. Those pictures can be used for save-the-dates, invitations, wedding decor, or for a custom-made guestbook that features your favorite images. 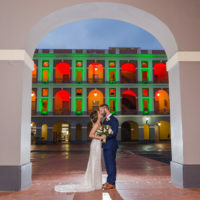 Newlywed sessions are much more relaxed and usually done during your honeymoon in Puerto Rico. With photo sessions starting at $550, elopement photography at $1,240 and wedding collections at $2,410, I have pre-recommended packages that might suit your interests and needs. But knowing every client and wedding is unique, I'm happy and willing to design a package customized for you. A full catalog of my services, products, and pricing is available upon request.